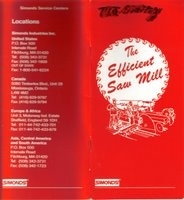 This booklet contains information with regard to selecting the correct saw, diagnosing and correcting problems with a circle head rig sawmill. It contains lots good information that could save you lots of grief. We shall hope so. Other helpful information on this subject may be found by clicking this link also try CBS-The Saw Guide. or do any number of things a new saw is not supposed to do. It is our purpose to lay out a simple procedure for checking a mill to isolate the causes of these troubles and to tell how to remedy them. The reason and old saw will cut while a new one may not is that the old saw has over a period of time conditioned itself to one ore more defects in the mill. As these mill conditions have become progressively worse, the saw has taken on a permanent dish or tension adjustment to compensate for these conditions. After properly adjusting the mill, the new saw, in most cases will cut perfectly, while the old one will need hammering. IMPORTANT- Until mill has been checked, you must assume the new saw is correctly manufactured in all respects. If you do this you will be right most of the time. it certainly is reasonable to assume that a new saw is more likely to be correct than a saw that has been used for months or even years. Clarksville Bearing & Supply, Inc.